Erythropoietin (EPO) is known to improve exercise performance by increasing oxygen blood transport and thus inducing a higher maximum oxygen uptake (VO2max). Furthermore, treatment with (or overexpression of) EPO induces protective effects in several tissues, including the myocardium. However, it is not known whether EPO exerts this protective effect when present at physiological levels. Given that EPO receptors have been identified in skeletal muscle, we hypothesized that EPO may have a direct, protective effect on this tissue. Thus, the objectives of the present study were to confirm a decrease in exercise performance and highlight muscle transcriptome alterations in a murine EPO functional knock-out model (the EPO-d mouse). We determined VO2max peak velocity and critical speed in exhaustive runs in 17 mice (9 EPO-d animals and 8 inbred controls), using treadmill enclosed in a metabolic chamber. Mice were sacrificed 24h after a last exhaustive treadmill exercise at critical speed. The tibialis anterior and soleus muscles were removed and total RNA was extracted for microarray gene expression analysis. The EPO-d mice’s hematocrit was about 50% lower than that of controls (p < 0.05) and their performance level was about 25% lower (p < 0.001). A total of 1583 genes exhibited significant changes in their expression levels. However, 68 genes were strongly up-regulated (normalized ratio > 1.4) and 115 were strongly down-regulated (normalized ratio < 0.80). 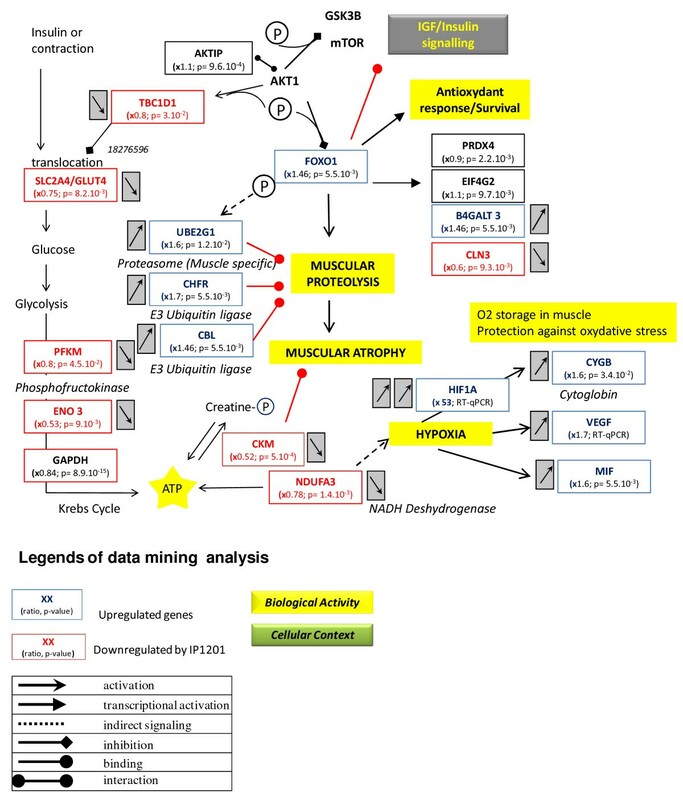 The transcriptome data mining analysis showed that the exercise in the EPO-d mice induced muscle hypoxia, oxidative stress and proteolysis associated with energy pathway disruptions in glycolysis and mitochondrial oxidative phosphorylation. Our results showed that the lack of functional EPO induced a decrease in the aerobic exercise capacity. This decrease was correlated with the hematocrit and reflecting poor oxygen supply to the muscles. The observed alterations in the muscle transcriptome suggest that physiological concentrations of EPO exert both direct and indirect muscle-protecting effects during exercise. However, the signaling pathway involved in these protective effects remains to be described in detail. 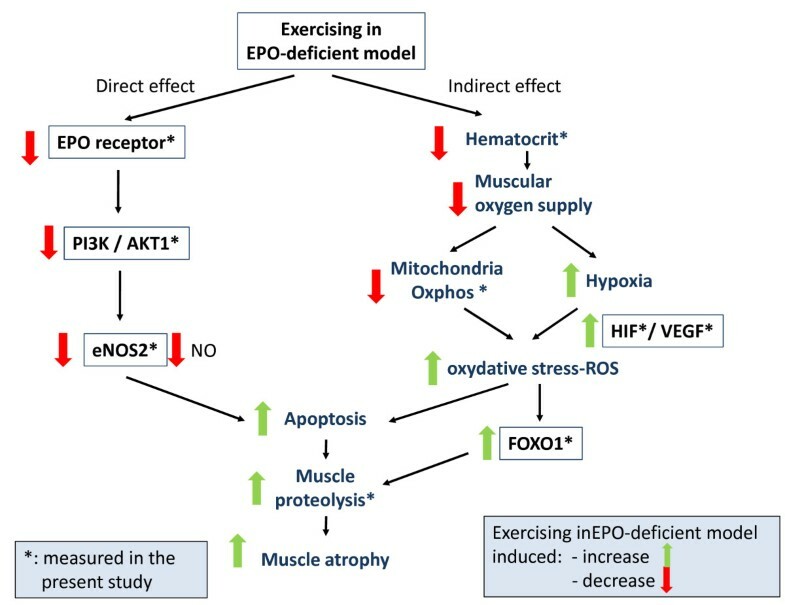 The hematopoietic effect of erythropoietin (EPO) is known to increase exercise performance by inducing a higher maximal oxygen uptake (VO2max) in athletes. This EPO cytokine is also used as a therapeutic in patients. Indeed, disease-associated, low levels of EPO lead to a drop in hematocrit (Htc), marked anemia and decreased exercise performance. Congestive heart failure (CHF) and chronic kidney failure (CKF) lead to progressive renal dysfunction and a decrease in EPO levels, with reduced erythrocyte production by bone marrow. Thus, reduced exercise capacity is a clinical hallmark in CHF and CKF patients, who typically show lower VO2max values than age-matched normal subjects. Indeed, as kidney function declines over time, there is a corresponding decline in exercise performance [1, 2]. The normalization of hemoglobin concentration in these patients by administration of EPO-stimulating agents improves exercise capacity and raises VO2max by increasing oxygen supply to muscles. Furthermore, the higher the increase in hemoglobin levels, the greater the improvement in exercise duration [3–6]. This effect continues at above-physiological levels of EPO. In cycling and running, the illegal administration of exogenous EPO is used to artificially increase performance levels (despite the occurrence of adverse effects). In addition, administration of recombinant human EPO (rHuEpo) was found to increase time to swimming exhaustion in a murine CKF model [7–9]. However, it is not known whether EPO directly affects muscle functions. Furthermore, it is now well accepted that EPO’s biological activity is not restricted to regulation of erythropoiesis. In fact, EPO is a member of the cytokine superfamily and has significant homology with mediators of growth and inflammation. The EPO receptor (EPO-R) is also known to be present in heart, neuronal, retinal, renal and muscle tissues [10–13]. Unsurprisingly, additional biological functions for EPO have been identified. The synthetic form of EPO has been shown to exert remarkable, tissue-protective effects on several tissues. The broad efficiency of EPO depends on its key role in various protective pathways, such as inhibition of apoptosis, vascular restoration, attenuation of inflammatory responses and better overall function [10, 14–18]. However, EPO’s protective role in muscle tissue has been mainly studied on cardiac muscle and in vivo and in various animal models . It has been shown that (i) rHuEpo pre-treatment attenuates myocardial infarct size and (ii) EPO has a cardioprotective effect on ischemia-reperfusion injury in various species [20–25]. This effect was hematocrit-independent (i.e. directly related to EPO), since EPO improved cardiac function at a dose that did not increase the hematocrit . However, it is not known whether physiological levels of EPO exert a protective role in skeletal muscles. In view of (i) the identification of EPO-R in muscle tissue and (ii) the known tissue-protective effects of EPO, we hypothesized that physiological levels of the cytokine may have protective effects on muscle. Thus, we used a murine EPO functional knock-out model (the EPO-d mouse, based on EPO immunization) to decrease active circulating levels of EPO and thus investigate the loss of function's impact on exercise performance and on the muscle transcriptome. The EPO-d mice had a low Htc and so we expected them to have lower performance levels and more impaired muscle oxidative function than inbred, control mice. Hence, the objectives of the present study were to confirm a decrease in exercise performance and highlight muscle transcriptome alterations in a murine EPO functional knock-out model (the EPO-d mouse). All protocols were approved by our institution’s Animal Care and Use Committee and complied with the Council of Europe’s European Convention for the Protection of Vertebrate Animals Used for Experimental and Other Scientific Purposes. The protein functional knock-out was obtained by immunoneutralization of circulating EPO, according to the vaccination method developed by Nokad® . Briefly, when immunization is performed with a modified self-protein like EPO, cross-reactive neutralizing antibodies are secreted and deplete the circulating protein. Repeated injections of the modified protein modulate the immune response and, in the present case, enabled us to study the effects of the loss of active, circulating EPO and the subsequent drop in Htc (US patent 2008/0220015A1). We always checked each EPO-d mouse’s Htc (down to as low as 20%) before initiating the exercise tests. A total of 17 adult female C57Bl6/J mice (9 EPO-d mice and 8 control inbred animals) were included in this study. They were ear–punched for identification. Male were excluded to avoid a potential gender effect. The mice were five months old when they performed the exercise tests. The animals were kept in an animal facility (CERFE, Genopole, Evry, France) in a specific and opportunist pathogen-free environment and at a temperature of 22°C with 12h:12h light-dark cycles. The animals were supplied with water and food ad libitum. The exercise testing protocol was performed on a single-lane motorized treadmill (Columbus Instruments, Columbus, OH) with an adjustable belt speed (0–99.9 m.min-1). The rear of the treadmill was equipped with a low-voltage, electric stimulating bar, to encourage each mouse to run. The bar was set to deliver 0.2 mA at a frequency of 0.25 Hz, which caused an uncomfortable shock but did not injure the animal. Oxygen consumption (VO2) was measured by means of a rapid-flow, open-circuit, indirect calorimeter. The single-lane test treadmill was placed in a metabolic chamber. Ambient air was fed through the chamber at a rate of 0.66 l.min-1; the flow was chosen such that the O2 difference across the chamber was within the sensor’s range (-0.3 to -0.8% O2). A fan mixed the incoming air with the air around the treadmill and blew it towards the animal. The air flowed from the front of the treadmill to the rear and then returned under the belt towards the front. This created a rapid, circular "loop" of mixed gases (incoming "fresh" air and accumulated exhaled gases) from which a sample was drawn for analysis (the Oxymax from Columbus Instruments). Gas samples were taken every 5s and dried prior to measurement of the oxygen and carbon dioxide fractions. The gas analyzers were calibrated with standardized gas mixtures (Air Products, Paris, France) before every test session, as recommended by the manufacturer. The treadmill test provided an estimate of VO2max, defined as the highest oxygen consumption attained over a 15-second period during the testing protocol. To allow rapid comparison over a wide range of body weights (and especially with human data), dimensional analysis and empirical studies show that VO2 should be expressed in relation to body mass raised to the power of 0.75. [28, 29]. The mice were familiarized with the treadmill over a one-week period via the completion of four 10-min running sessions from 0 to 9 m.min-1 (0, 3, 6 and 9 m.min-1). All mice succeeded in running for the required time at an intensity of 9 m.min-1. The velocity was not increased above this value, in order to avoid a training effect. The mice subsequently performed an incremental exercise test. Starting from a speed of 10 m.min-1, the exercise intensity was increased by 3 m.min-1 every 3 min, with an incline of 0%. Exercise continued until exhaustion, which was defined as an inability to maintain the running speed despite contact with the electric grid for more than 5 sec. All measurements were made by the same investigator. The last stage completed by the mouse was defined as the peak velocity (vPeak). Blood lactate levels were measured before the exercise and two minutes after the end of the exercise ([La]INC). After local antisepsis with alcohol, the distal 2mm of the animal’s tail was cut off. To avoid contamination, the first drop of blood was discarded. Next, a 5 μl blood sample was collected on a small test strip and the blood lactate concentration was measured with a Lactate Pro assay (Arkray Inc., Kyoto, Japan). The protocol consisted of four constant-speed runs (18–51 m/min) leading to exhaustion within one hour, as described in an earlier study . A single trial was performed per day, and the protocol covered a period of 4 days. The time to exhaustion was recorded at each speed. Two parameters were used to estimate endurance performance: the distance the mice were able to cover at a given speed (limit distance, in meters) and the time needed to cover the distance (limit time, seconds). The critical speed (CS) was calculated, from the slope (a) of the regression line, plotting the distance (y) vs. the time to exhaustion (x) from the four tests, according to the equation y = ax + b. At least two days after the end of the determination of CS, vPeak and VO2max, all animals ran at their individual CS until exhaustion. We recorded the time to exhaustion and the blood lactate concentrations before and 2 min after the end of exercise ([La]SS). Mice were sacrificed by cervical dislocation 24h later. The tibialis anterior and soleus muscles were rapidly removed, immerged for 2 hours in RNAlater reagent (Ambion, Austin, TX) and then frozen in liquid nitrogen. The samples were then stored at -80°C prior to RNA extraction for microarray and RT-qPCR analysis. Gene expression analysis was performed using a 25K mouse long oligonucleotide microarray [Gene Expression Omnibus accession number GPL8349: http://www.ncbi.nlm.nih.gov/geo/query/acc.cgi?acc=GPL8349, ]. The microarrays were spotted (LEFG, CEA, Evry, France) by printing the probes (suspended in a spotting buffer composed of 1:1 v/v dimethyl sulfoxide (DMSO) and Tris EDTA buffer) on hydrogel slides (Nexterion, Schott) with a Microgrid-II robot (Genomic Solutions Inc., Ann Arbor, MI). Total RNA was extracted from each muscle sample using a phenol-chloroform method (TRIzol ® reagent, Invitrogen Life Technologies, Carlsbad, CA, USA). The quality of total RNA was verified by micro channel electrophoresis (RNA 6000 Nano LabChip, Bioanalyzer®, Agilent, Agilent technologies, Santa Clara, USA). The total RNA concentration and purity were measured by optical density with a spectrophotometer according to the absorbance at 260 nm and the 260nm/280nm absorbance ratio, respectively (Nanodrop®, Thermo Scientific, Wilmington, DE, USA). RNA was considered as pure when the 260nm/280nm absorbance ratio was close to 2. The total RNA extracts were stored at -80°C prior to microarray analysis. The tibialis anterior RNA extracts from each mouse were pooled into the corresponding EPO-d and control groups. Likewise, soleus muscle RNA extracts were pooled into an EPO-d group and a control group. Eight mouse 25K microarrays were used to analyze the samples using a dye-swap design. (2 groups x 2 muscles x 2). Briefly, the hybridization protocol  included the following steps: after purification of the amino-modified RNA, monofunctional forms of cyanine-3 (Cy3) or cyanine-5 (Cy5) fluorochrome were coupled to 5 μg each of the test and control samples using an indirect method: the fluorochromes’ ester groups were bound to aminoallyl groups incorporated into the RNA during in vitro transcription. The synthesis of RNA with a polyA tail was performed using in vitro transcription with aminoallyl UTP. A total RNA (1 μg) was used to start the synthesis using the in vitro transcription kit according to the manufacturer’s protocol (Aminoallyl MessageAmp ® II aRNA, Invitrogen Life Technologies, Carlsbad, CA, USA). This method equally increased the number of mRNA copies of each transcript without changing the proportion of the initial population of transcripts. The purity and concentration of aminoallyl RNA (aaRNA) were again checked by microchannel electrophoresis (with a RNA 6000 Nano LabChip in a Bioanalyzer) and spectrophotometry (Nanodrop). The aaRNAs were stored at -80°C. The marked targets were then mixed and hybridized on the same chip for immediate comparison of the two nucleic acid populations. For each sample, a dye-swap (duplicate measurement) was performed to avoid asymmetry of marker affinity (Cy3 and Cy5). The fluorescence intensities of Cy3 (532 nm) and Cy5 (635 nm) were imaged separately with a laser scanner (GenePix 4000B, Molecular Device, Sunnyvale, CA, USA). The resulting tiff images (10 μm/pixel) were analyzed using dedicated microarray image analysis software (GenePix Pro 6.0 software, Molecular Device, Sunnyvale, CA, USA) that located each spot automatically (with manual control) and quantified its fluorescence intensity. For each microarray, the data output were the fluorescence intensities of all the spots corresponding to each gene. These data were imported into genomic data analysis software (Gene Spring software, Agilent Technologies, Santa Clara, CA, USA) to normalize the data before filtering and statistical analysis. For each sample, a duplicate analysis (dye-swap) was made and the average fluorescence results were used. Next, all the results were normalized per spot and per microarray with a locally weighted scatterplot smoothing regression method, in order to remove systematic variations. Lastly, the expression ratio was obtained for each muscle and each gene. For statistical analysis, a log transformation ratio was used to normalize the distribution. A list of the significant genes were obtained by filtering the genes with a cut-off T-test (p-value < 0.05). Benjamini and Hochberg multiple testing correction was used to avoid a biased discovery rate  The Student t-test detected the mean expression ratio of replicates that differed significantly from one (i.e. an expression ratio of 1 means that there was no change in gene expression). In order to validate the most significant results from the microarray analysis, quantitative RT-qPCRs were conducted in triplicate for the top ten up- and down-regulated gene transcripts in muscles from both EPO -d and control inbred mice. The primers were designed using Primer express software (Applied Biosystems, Life Technologies, Carlsbad, CA, USA) (Table 1). All reactions were carried out in a 7500 Real-Time PCR System (Applied Biosystems). Briefly, reverse transcription was performed on 20 ng of the aaRNA used for microarray hybridization. Random primers (100 ng) and 10 pmol of dATP, dCTP, dGTP and dTTP were added to RNA in a 13 μL final volume. The reaction tubes were incubated at 70°C for 5 min. The mixture was incubated with random annealing primer at room temperature (~25°C) for 10 min. Four microliters of 5x first-strand buffer, 200 pmol of DTT and 200U of Superscript II reverse transcriptase were added to the tube to give a 20μL final volume and incubated at 42°C for 1 hour. The enzyme was inactivated by incubating the mixture at 70°C for 15 min. The cDNA concentration was measured in terms of the optical density at 260 and 280 nm (Nanodrop ®). The cDNA solution was diluted in water to obtain a final concentration of 20 ng/μL and stored at -20°C. Complementary DNA (100 ng) obtained from aaRNA was amplified in a 20 μL PCR reaction with 10 μmol of each specific primer and 10μL SYBR® Green PCR Master Mix (Qiagen, Hilden, Germany). Amplification steps were as follows: denaturation for 10 min at 95°C, 40 cycles of denaturation at 95°C for 15 s and annealing extension at 60°C for 1 min. The comparative threshold cycle (Ct) method was used to calculate the amplification, as specified by the manufacturer. The expression results of the RT-qPCR for muscles from EPO-d and control inbred mice were normalized against the mean Ct for the endogenous gene Cish2 (measured in all muscle samples and found to independent of the EPO deficiency). Each gene’s relative expression ratio in the EPO-d mice was calculated according to the expression of the corresponding gene in the control mice. A biological interpretation of the data was performed using two data-mining programs to identify the main biological functions and the main metabolic pathway disorders revealed by the expression profile in EPO-d muscles. Ingenuity® Pathway Analysis (http://www.ingenuity.com) was used to identified the biological functions that were the most significantly associated with the gene list results. Significant genes whose functions had been described in published papers were considered for the analysis. Fischer’s exact test was used to calculate a p-value for the probability with which each biological function assigned to a data set was due to chance alone. The analysis of the main metabolic pathways and their potential dysfunctions was performed using Predictsearch® software written in Java/Perl (Prediguard, http://prediguard.com/predictsearch.htm), which has been previously described in . This software characterizes the pathways and functional networks in which the selected genes are involved. Briefly, gene aliases corresponding to the significant modulated genes were submitted as queries to PubMed in order to collect titles and abstracts of all related publications. The results are presented in a graph that shows the relationships between each gene and each cell type, cellular compartment and biological function. A Mann-Whitney U test was applied to compare variables in EPO-d mice with those in control mice variables. A Spearman test was used to test correlations between exercise parameters. A three-way analysis of variance was used to test the effects of EPO deficiency, muscle and gene on the RT-qPCR Ct values. The two groups of mice did not differ significantly in terms of age and weight at baseline. The EPO-d group showed a two-fold decrease in Htc, relative to the control group (19.56 ± 2.74% and 40.75 ± 2.71%, respectively; p < 0.0001). The VO2max, vPeak, and CS performance indexes were lower in the EPO-d group than in the control group. However, the two groups did not differ in terms of the time to exhaustion at the CS (Tlim). The [La]INC measured at the end of the incremental exercise was higher in the EPO-d group, whereas the [La]SS values measured at the end of steady-state exercise at the CS were similar (Table 2). Data are quoted as the mean ± SD; NS: not significant at p < 0.05; V ˙ O 2 : oxygen consumption; V ˙ O 2 max :maximum V ˙ O 2 . 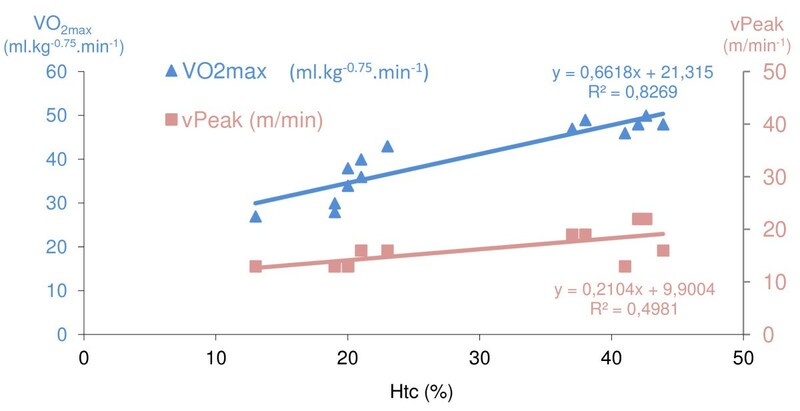 The VO2max and vPeak were correlated with the Htc in each group separately and when pooled (p < 0.05) (Figure 1). In the control group, there was a correlation between the Htc and the CS (r =0.828 , p < 0.05). Correlations between hematocrit on one hand and peak velocity and VO 2max on the other. Thirty-three percent of the microarray probes (especially those for mitochondrial genes) hybridized with a significantly high fluorescence value. All the data from the present study have been deposited in the Gene Expression Omnibus (accession number pending). After filtering the normalized expression ratios with a cut-off at p < 0.05 (i.e. a significant difference from 1), a total of 1583 genes exhibited significant changes of expression levels between the EPO-d and the control mice ( Additional file 1: Table S1). Most of the changes were moderate (0.80 < normalized ratio < 1.4). However, 68 genes were strongly up-regulated genes (normalized ratio > 1.4) and 115 were strongly down-regulated (normalized ratio <0.80) (Tables 3 and 4). A p-value <0.05 indicates that the expression ratio differed significantly from 1. The changes for 23 strongly up- and down-regulated genes (according to the microarray analysis) were validated by RT-qPCR analysis (Table 5). The gene expression values (Ct) did not depend significantly on the type of muscle (the tibialis anterior vs. the soleus) but there was a statistically significant interaction with the EPO-d treatment factor. There was a significant Pearson correlation of 0.87 (p < 0.01) for the expression values of 19 genes tested by the two methods RT-qPCR and microarray analysis, respectively. Despite the differences in methodologies, gene probes and primers, the regulation results (up- or down-regulation) were consistent for 10 genes. Two genomic markers of hypoxia (hypoxia-inducible factor 1 alpha subunit (Hif1a) and vascular endothelial growth factor alpha (VEGF-alpha)) were significantly up-regulated in RT-qPCR but not in the microarray analysis after filtering for the p-value (slight up-regulation (1 < normalized ratio <1.2); p = 0.21 and 0.22, respectively. The averaged Ct values of the triplicate analysis are quoted for EPO-deficient and control mice. The Ct values were normalized against Cish2 expression because the latter was not affected by the EPO deficiency. The relative expression of each gene in EPO-deficient mice was calculated by comparison with the corresponding gene expression in control mice. There was a statistically significant correlation (Pearson coefficient: 0.87; p < 0.01) between the expression values for 19 genes according to the RT-qPCR assays and the expression values according to the microarray analysis. We used Ingenuity Pathway Analysis® to classify our list of modulated genes by cellular function and by canonical and signaling pathway. Three groups of functions were detected (Table 6): (i) catabolic pathways, including cell death, protein degradation and lipid metabolism, (ii) anabolic pathways, including protein synthesis, cell cycle, growth and proliferation, DNA replication, cellular assembly and molecular transport; (iii) communication, with cell-to-cell signaling and cell signaling. Cell death, protein synthesis, cellular growth and proliferation and lipid metabolism were the main cell functions that were significant associated with between 9 and 12 modulated genes (Table 6). The tissue, organ and cellular context and the associated biological activities were further investigated with a Predictsearch® analysis. Using the PubMed database, it was found that 31 of the significantly modulated genes were strongly associated with the following biological activities: apoptosis, proteolysis, glycolysis, cellular trafficking and cytoskeleton. In addition, the most frequently cited disease pathways in relation to the gene set were muscle atrophy, hypoxia and oxidative stress. The main pathway disruptions revealed by Predictsearch® data mining are described in Figures 2, 3, 4 and 5. 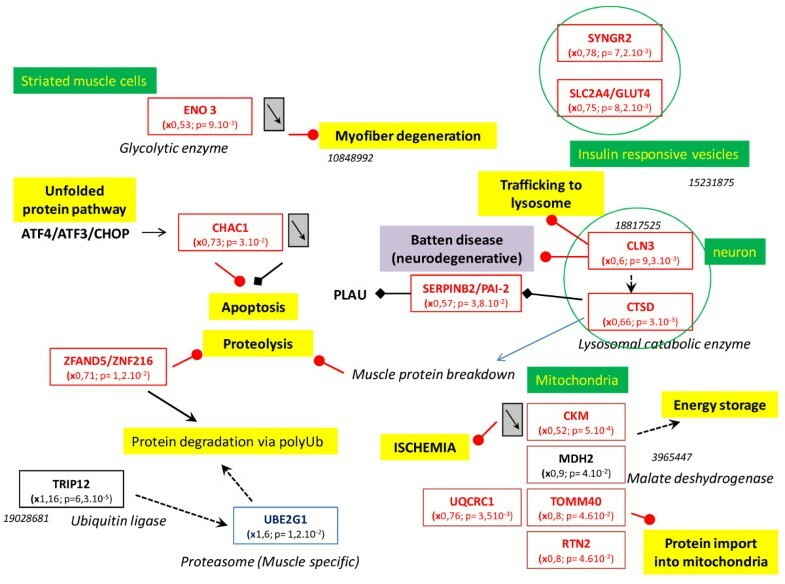 Main pathway disorders leading to muscle proteolysis, atrophy, hypoxia and anti-oxidant response. Legends of the figures 2-5 are indicated under this figure. Impairment in ATP production. Impaired ATP production, with down-regulation of genes involved in glycolysis, mitochondrial oxidative phosphorylation and the phosphocreatine kinase pathway. Other than some moderately up- or down-regulated subunits of NADH dehydrogenase, most of the genes were down-regulated. Legends of this figure are provided in Figure 2. The gene regulation of cytoskeleton components. None of the genes were significantly up-regulated (x > 1.4) but seven were moderately up-regulated ( 1 > x > 1.4). All other genes in this category were moderately or severely down-regulated. Legends of this figure are provided in Figure 2. Down-regulation of many genes involved in intracellular trafficking. Legends of this figure are provided in Figure 2. The forkhead box O1 (Foxo1) gene was significantly over-expressed and may activate muscle proteolysis in conjunction with three other up-regulated genes involved in the muscle proteasome (Ube2g1) and E3 Ubiquitin ligase (Chfr and Cbl) (Figure 2). 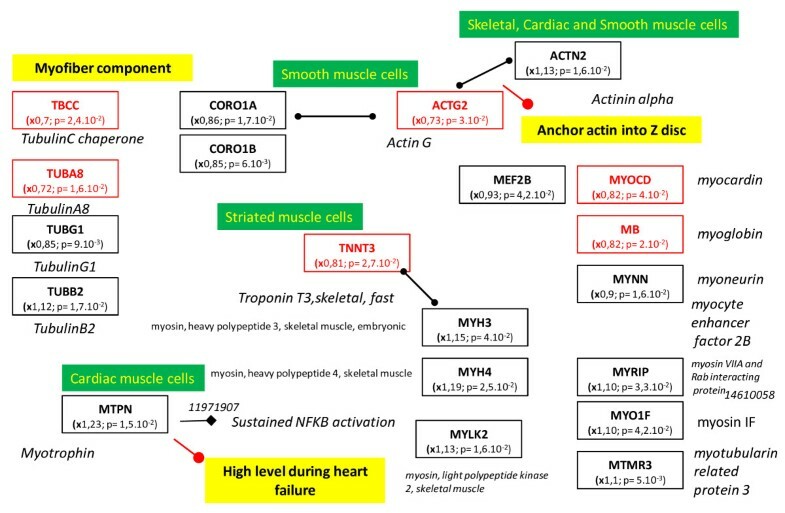 Chronic proteolysis of myofibrils may be responsible for muscle atrophy. 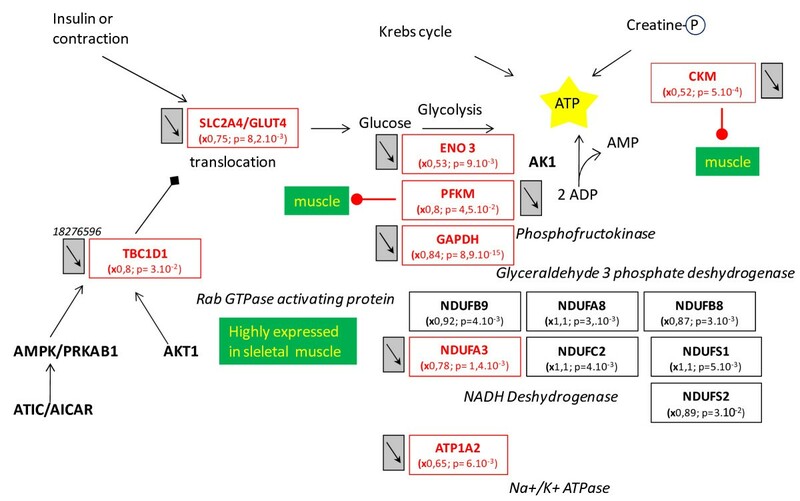 Glucose import into muscle cells by the glucose transporter type 4, insulin-responsive (Slc2a4/Glut4), was down-regulated and probably contributed to a decrease in ATP production. In addition, several genes coding for key enzymes in glycolysis (Pfkm, Eno3 and Gapdh), mitochondrial oxidative phosphorylation (NADH dehydrogenase unit Ndufa3) and the muscle creatine kinase (Ckm) were down-regulated. The two genomic markers of muscle hypoxia (Hif1a and Vegf) were up-regulated. Low mitochondrial activity seemed to be related to hypoxia signaling with two up-regulated downstream genes: cytoglobin (Cygb) and macrophage migration inhibitory factor (Mif). The up-regulation of Foxo1 gene could be interpreted as a signal of anti-oxidant response by the muscle cells, with up-regulation of glycoprotein-4-beta-galactosyltransferase 2 (B4galt) and eukaryotic translation initiation factor 4 gamma (Elf4g2) and down-regulation of ceroid lipofuscinosis neuronal 3 (Cln3). Seven genes coding for cytoskeleton components were moderately up-regulated (1 < x < 1.4) and all the other genes were moderately or significantly down-regulated (Figure 4). These down-regulations may affect the synthesis of the cytoskeleton proteins: actin, tubulin, troponin and myosin. Decreased expression of the genes coding for cytoskeleton components and ATP production by glycolysis may be related to the decrease in intracellular trafficking (Figure 5). Mitochondrial protein import was probably decreased by the concomitant down-regulation of five genes: Tomm40, Ckm, Mdh2, Rtn2 and Uqcr1. These changes may also have contributed to the decrease in mitochondrial oxidative phosphorylation activity. The insulin-responsive vesicles transporting glucose into the cells (Sclc2a4/Glut4; Syngr2) and lysosomal vesicles transporting catabolic enzymes (Cln3 and Ctsd) were significantly down-regulated. Protein degradation in the proteasome was stimulated by the up-regulated ubiquitin-conjugating enzyme (Ube2g1) and the down-regulated zinc finger protein (Zfand5/Znf216). Down-regulation of the cation transport regulator-like protein 1 (Chac1) may contribute to the inhibition of apoptosis. The cell survival factor serine (or cysteine or plasminogen) peptidase inhibitor (Serpinb2/Pai-2) was strongly down-regulated and would not have provided its usual cell protection activity. Most of the studies on muscle exercise or doping are based on the use of acute or chronic EPO injection to stimulate endurance capacity. In the present study, the EPO-d model was used to study the effects of EPO loss-of-function on the muscles of exercising mice. To date, the study of adult EPO-d animals has been limited by the fact that EPO gene knock-out (KO) is embryonic lethal [35, 36]. Protein functional knock-out by immunoneutralization of circulating EPO is a novel way of inducing EPO deficiency in live, active mice . Thus, the effects of the EPO deficiency were evaluated through an integrative biology approach in order to reveal potential consequences at the physiologic and genomic levels. The EPO-d mice had an Htc of about 20%, i.e. two-fold lower than in control mice and much lower than the value of 58% for maximal exercise performance in wild-type mice . However, this low Htc did not prevent the performance of valid exercise tests. Another type of murine EPO-d model is the EPO-Tagh transgenic mouse, which displayed about the same, low Htc (19.3%) in normoxia as in our model . After two weeks of rest, the researchers did not observe an elevation in Hif1a or muscle atrophy - suggesting that a lack of EPO does not cause structural damage to muscles. However, the studied animals did not perform exercise. In fact, the observed activation of the EPO-R by acute exercise suggests that physiological levels of EPO do have a role in exercising muscle tissue . Indeed, the combination of exercise and chronic EPO deficiency in the present study resulted in hypoxia with Hif1a accumulation and muscle atrophy. In the present study, reductions of between 25% and 30% in vPeak, VO2max, and CS attested to the subnormal exercise performance in EPO-d mice. However, the time to exhaustion was not different between groups. This is not consistent with the 50% decrease (vs. controls) in the time to exhaustion in a swimming test observed in a murine CKF model with a low Htc (28% lower than in controls). However, the intensity of the swimming exercise was not quantified and the absolute intensity was probably similar in the two groups. In the present study, performance was first assessed in terms of vPeak and VO2max. Next, the intensity chosen for the exhaustive exercise (at CS) was individually related to performance (at around 80% of vPeak); thus, all mice were exercising at the same relative intensity. This explained the fact that the time to exhaustion was similar in the two groups and confirmed the relevance of CS in the running mouse model . Furthermore, VO2max was correlated with the Htc as previously observed by Schuler (2010). This relation is valid in each group and in the whole study population. These results validate this EPO-d mouse model in physiological terms. However, in the present study, total hemoglobin was not determined. This question is controversial; in general, total hemoglobin is correlated with VO2max rather than Htc. Indeed, elevated hemoglobin is correlated with an elevated VO2max in humans  and there is an optimal Htc (57%-58%) for a maximal performance in EPO-treated mice . Above this level, performance levels decrease and excessive erythrocytosis leads to multiple organ degeneration, including damage to heart and skeletal muscles [40, 41]. The impact of hemoglobin concentration on VO2max becomes greater under non-physiological conditions (such as blood loss or doping). Indeed, data from anti-doping studies generally show a similar relationship between the hemoglobin concentration and VO2max, as observed after blood loss . However, in contrast with data from humans, the control mice in the present study showed a significant correlation between Htc vs. VO2max. (i.e. in the physiological range). This set of physiological results emphasized the poor endurance capacity in EPO-d mice, which may be related to their impaired aerobic capacity relative to control mice. They exhibited a lower VO2max and higher blood [La]INC which are physiological signs of hypoxia. This was confirmed at the genomic level by strong up-regulation of Hif1a, which acts as the master regulator for the expression of genes involved in the hypoxia response in most mammalian cells [42, 43]. There were some indirect signs of muscle hypoxia, with the up-regulation of Vegf, Cygb and Mif. In addition, some NADH sub-units involved in mitochondrial oxidative phosphorylation and other genes coding for mitochondrial proteins (Ckm, Mdh2, Tomm40, Rtn2, Uqcrc1) were down-regulated. Chronic muscle hypoxia could be directly related to the animals’ low Htc and the drop of oxygen tension in the muscle fibers and mitochondria. This hypoxia was associated with cell oxidative stress, as indicated by the up-regulation of the Foxo1 marker. On the mitochondrial level, it has been reported that about 2% of the oxygen used by the respiratory chain is incompletely reduced and produces superoxide radicals . The overproduction of reactive oxygen species (ROS) in hypoxia is a surprising finding but has been previously described in hypoxic cardiomyocytes  and in muscles with glycogenosis and mitochondrial dysfunction . In the present study, we found that several genes coding for NADH subunits were down-regulated, resulting in uncoupling with the Krebs cycle. Thus, the respiratory chain complex I could be responsible of the lack of reduction and would provide electrons for ROS generation. If O2 is not entirely reduced to water by complex IV, ROS generation seems to contribute to the O2 signaling pathway . The ROS-like superoxide anion radical O2 -, hydrogen peroxide and the hydroxyl radical .OH are all able to damage proteins, DNA and membranes. However, the generation of .OH from hydrogen peroxide by an iron-dependent Fenton reaction within or close to the nucleus could trigger the expression of redox-sensitive transcription factors such as Hif1a. Thus, ROS generation could be the primary messenger responsible for Hif1 transcription factor regulation, which may explain the relationship between oxidative stress and hypoxia. The present transcriptome data mining analysis showed that the EPO deficiency induced expression changes in genes related to muscle hypoxia and proteolysis. In addition, 12 significantly modulated genes were involved in cell death and apoptosis (Table 6). Thus, one can assume that physiological concentrations of circulating EPO have a muscle-protecting effect. It has been reported that after acute exercise, EPO-Rs are up-regulated in satellite cells and muscle fibers - suggesting a muscle-specific EPO signaling pathway . The muscle-protecting effect of EPO could be related to anti-apoptotic activity, as has been demonstrated in a model of cadiomyocyte ischemia . In fact, EPO activates (through the EPO-R) the PI3 kinase /Akt signaling pathway and thus increases both eNOS expression and phosphorylation. Production of NO by eNOS inhibits cardiomyocyte apoptosis. The NO has both anti-apoptotic and pro-apoptotic activities by modulating multiple sites in the death signaling pathway and the mitochondrial apoptosis pathway . However, most of the anti-apoptotic activity seems to occur via an increase in Bcl-2 expression and prevention of cytochrome c release from the mitochondria. Other pathways may have a muscle-protective effect, such as L-type calcium channel inhibition and the up-regulation of protective proteins (such as heme-oxygenase-1, heat shock proteins Hsp70 and metallothionein). In the present study, some results were consistent with a potential role of EPO in the anti-apoptotic pathway in exercising muscle. We found that EPO-R, nitric oxide synthase 2 inducible (Nos2) and Akt1 were down-regulated in EPO-d mice. Akt is also associated with muscle protein synthesis and hypertrophy . In contrast, EPO injections do not affect EPO-R signaling in muscles under resting conditions - suggesting an indirect effect of EPO related to an increase in oxidative capacity . We did not detect Hsp70 modulation but two Hsp90 genes (Hsp90aa1, Hsp90b1) were up-regulated. The heat shock protein 90 family is known to stabilize and accumulate Hif1a under hypoxic conditions, which is consistent with our observation in an RT-qPCR that Hif1a was highly up-regulated . It has been reported that EPO may also exert an anti-oxidant effect in the blood vessels by up-regulating superoxide dismutase (Sod1) . These previous results may be related to our finding of muscle oxidative stress in EPO-d mice, with a combination of down-regulation of Sod1 and up-regulation of Foxo1 as a response to oxidative stress. Low muscle oxidative stress stimulates muscle adaptation and performance levels but high oxidative stress decreases muscle force production by inhibiting the sarcoplasmic calcium ATPase (Serca) , which may explain the poor exercise performance of the EPO-d mice in the present study. In addition, it has been shown that oxidative stress contributes to the increase in muscle atrophy by accelerating muscle protein degradation by the calpains and caspase-3 . However, this observation was made in isolated muscle fibers in vitro and one can legitimately suppose that exercise activity may increase this phenomenon, since we observed major proteolysis activity in the present transcriptome analysis. Taken as a whole, our present results and literature data prompted us to suggest a putative signaling pathway that may explain EPO's direct and indirect protective effects on skeletal muscle (Figure 6). Moreover, the transgenic rescued EPO-R-null mutant mice would be an interesting tool for elucidating the relative contributions of EPO's various non-hematopoietic effects . Overview of the direct and indirect effects of EPO loss-of-function on muscle. On the basis of the present study's results, our model seeks to explain the impact of a lack of functional EPO on muscle tissue in the EPO-d mouse. From a physiological point of view, our study validated the EPO-d mouse model by demonstrating worse exercise performance than in control mice with a normal Htc. This poor exercise performance could be explained by the lower Htc, chronic hypoxia, muscle oxidative stress and the severe muscular proteolysis revealed by the transcriptome analysis. Our results suggest that physiological levels of EPO cytokine exert both direct and indirect protective effects on muscle during exercise. However, the signaling pathway involved in these protective effects remains to be described in detail. LH, EB, VB designed the study and drafted the manuscript. LH, EH carried out the mouse tests and physiological analysis. EB, BB carried out the transcriptomic analysis. EH, EB carried out the qPCR validation. FJ, PB carried out the transcriptomic interpretation. All authors read and approved the final manuscript. Zinc finger A20 domain-containing protein 2. This study was funded by a Genopole® ATIGE grant (Evry, France) and the French National Institute of Health and Medical Research (INSERM). Animals were kindly provided by Nokad® (Evry France). The authors thanks Dr Amine Abina for his contribution to conception and design of the study, and Macha Musulmani for her help in the collection of biological tissue.